Bloomington is a town I don’t have the opportunity to visit that often. If I’m lucky, I get down there once or twice a year, which is a shame because Bloomington has friends, has good restaurants, and has some cool Geeky shops. This past August, as we were down there for the Indiana Toy and Comic Expo, I had the opportunity to stop by one of those cool shops, and I’m finally able to put it up on the blog! 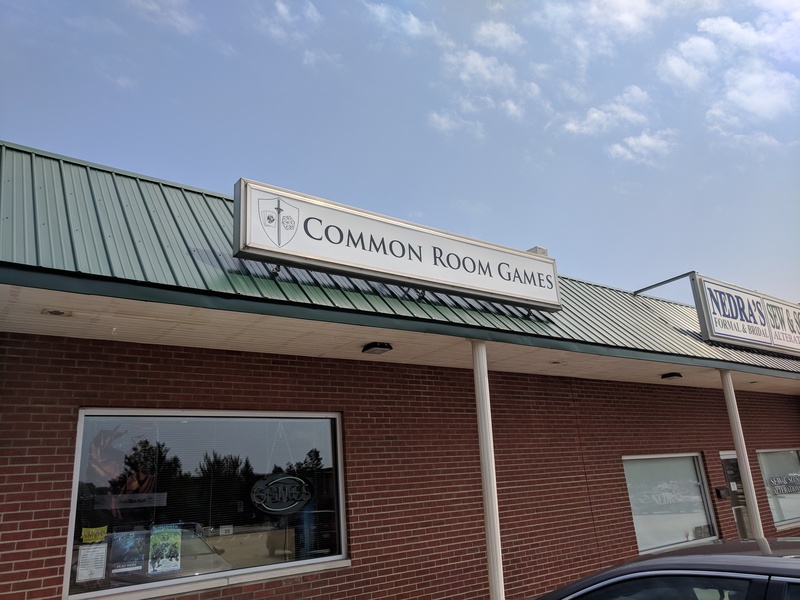 The Common Room is a game shop located in Bloomington. It started serving the gamers of Bloomington in 2012, and moved into its current location in 2013. 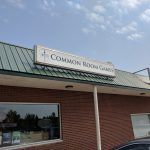 They carry games, CCGs, minis (see more info below), and they have open gaming areas, along with private gaming rooms to rent. They have a Games Club and a board game library, and their location is even a Pokestop if you’re playing Pokemon Go. In addition to all of that, their location is smack in the middle of a bunch of shops and restaurants, and of course they have snacks and beverages for sale on site. When Lizz and I dropped in on a Saturday afternoon, the place was packed. In fact, that’s why my photo gallery below doesn’t have any pictures of the main gaming space, or the side rooms, because they were full, and I try not to put pictures of people up on their blog without their permission. We spent some time looking around, browsing over the games, and admiring the Magic: The Gathering card wallpaper (Hey, I used to play with that one…) while waiting for the employee behind the counter to have a spare moment. After getting permission to get pictures of the inside of the shop, I commented that I didn’t see any Warhammer around, which I’ve noticed is a staple for most game shops. I was told they are more than happy to order for anyone who was looking for something specific, but normally it just kinda sits there. Nothing wrong with that answer, it means they’re paying attention to their customer base. All in all, we really enjoyed hitting The Common Room. It was a friendly shop, it had a good vibe to it, it was very welcoming, plus it’s a Pokestop! If you’re down in Bloomington, drop by and give it a look. Look under the information for some pictures representing the shop. Remember: these pictures were taken 8/25/2018, so the product you see in the pictures might not be the product currently in hand. What is their parking situation? There is lot parking in the strip mall. Just kidding on the phone number. Internet! Where are they online? You can see what’s happening on their website, or on their Facebook page.